If you are shopping for the best charcoal grills under $200 in the market, then this is the guide that you need. When it comes to grilling, any season is a perfect season to serve up delicious tasting, smoky flavored, and juicy textured meat. 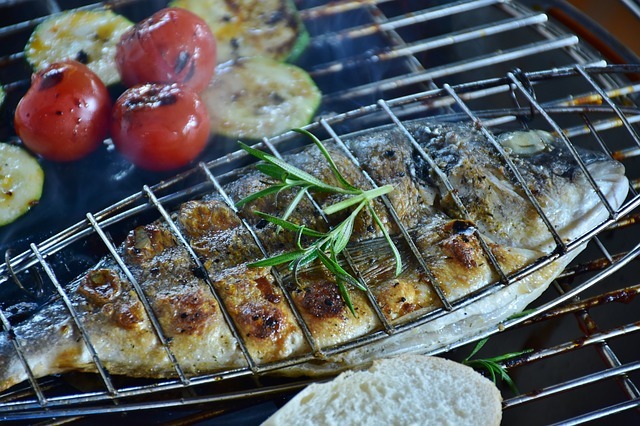 From grilling crab legs to T-bone steaks, corn and carrots, or fresh fish, grilling has revolutionized the way many families eat in the summer. Giving the oven and stove a rest, a good grill can produce enough meat to feed a party more than ten in a single cookout during the summer. On the other hand, grilling is ideal for tenderizing steaks in the cooling months. For most of us, looking to invest in a strong serving grill, the question on picking the best charcoal grill easily pops up. 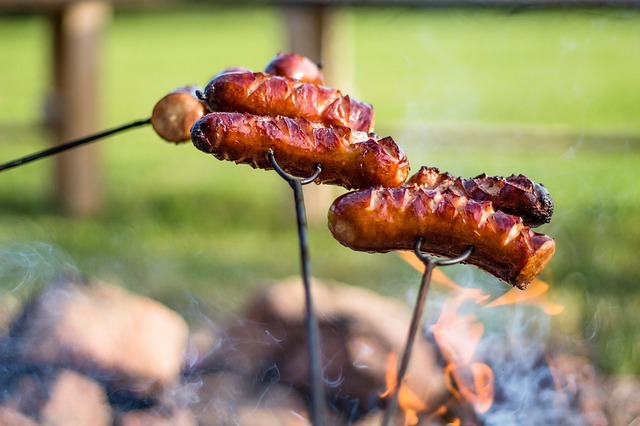 Grilling pros have their favorites for different reasons, but they have an overall favorite among the best and competing brands on the market. With hundreds of grills in the market (where most of them are crap), finding the right one to buy is surely a big hassle. This is why we have created this charcoal grill buying guide to help you find the right one to enjoy the best meat delicacies. Our list is based on real user reviews, first hand testing and also with the aid of grilling aficionados with years of backyard grilling. To ensure that this list is always up to date, we keep it updated from time to time. More details and in-depth review of each of these top charcoal grills below and why we picked them. We’ve also included 2 high end grills that are over 200 dollars, but worth mentioning. Without a doubt, the One touch gold is the best charcoal grill that comes under 200 dollars. Grilled food is considered a healthier alternative to cooking with oil. It is also a faster alternative to other forms of cooking. The Weber 741001 22-Inch One-Touch Gold Charcoal Grill, Black is made of porcelain-enameled steel, which is a trademark of all Weber grills ranks as one of the best charcoal grills in the industry. The size of the cooking surface is 22-1/2 inches in diameter. To facilitate convenience, the nickel plated grate has two hinged side openings; through it, it is easy to put in more charcoal safely. For easy cleaning of the grill, there is the one touch cleaning and venting system. This system is a collection of blades that sifts the ash out of the kettle, into the ash catcher. This setup aims to reduce the amount of time it takes to clean the grill. A 31 page booklet with usage instructions and recipes is provided to get the user started. The Weber 741001 comes with a 10 year warranty. Weber is a reputed grill maker and all their grills are an appreciated lot. This gold model charcoal grill from Weber also shares the reputation of being a good grill. In the reviews that we have come across (over 100 of them), there seems to be a unanimous agreement that this grill is a good one. The Weber is known for its construct, which gives their grills extended life. The Porcelain-enameled steel on this grill makes it a tough one. It protects the grill from wear and also from rust. So even if you were to leave it in the rain, it will not rust. The construct of the grill was one of the main reasons why this grill is a favorite. The grate, which are nickel plated, are double hinged and allow refueling easily and safely. In other grills it is not so easy and those reviewers who have used other grills before have testified to the ease of this feature. The sturdy wheels make it easy to move, without having to lift the grill. Another remarkable feature of this Weber grill is the cleaning system. This was liked by all the reviewers as it greatly reduced the burden of cleaning the grill. The one touch button that activates the cleaning mechanism pushes all the ash into the ash catcher. To sum it all up, the large cooking grate which provides a large cooking surface with a diameter of 22 ½ inches is big enough for six large steaks, twice as many burgers, or up to a dozen kebabs. That is quite a lot of cooking and even with friends/relatives, it is not going to be difficult to feed all. Weber 741001 22-Inch One-Touch Gold Charcoal Grill comes with a 31 page booklet that makes setting the grill easy. This grill also comes with a 10 year warranty. Second in our list of the best charcoal grill under 200 dollars is the Char-Griller 2137. Charcoal grill are most favored in the market compared to gas grills because they are cheaper and portable. The outlaw grill offers cooking area over 1000 square inches. It is suitable to feed a large family. You can grill large pieces of meat on the grill. It is made from heavy gauge steel. It is designed to last long. The grates are made from cast iron which will give good flavor on the meat. The grates distribute heat evenly and this will keep the flavor in good condition. You can control the heat with adjustable fire grate. The dump ash pan is provided for easy cleaning of the pan. The double bottom of the grill is built to last years since it is built from heavy gauge steel. The Char-Griller is a barrel style charcoal grill. It is available for affordable price. The prefect designed rectangular shapes of barrel style box grill allow very good cooking surface area. It is really good compared to Weber kettle type. It is also easier to manipulate coal for indirect cooking. It has a built-in heat gauge, an airtight flanged hood and three shelves. It is designed to meet the demands of large gatherings. It is perfectly suitable for camping with friends and family. The important feature to note is that it takes longer time to heat up and cool down. Hence it may not be advisable for small sized cooking items. it is perfectly designed to cater for large crowd. Very useful charcoal grill if you want the flavor and quantity, it is the perfect choice. Most customers have reviewed the product as good. There more than a couple of dozen reviews on this product with the average customer rating of 4.5-star. Most of them have said that the grill was good and it has large cooking surface area which was really good feature. Compared to Smoking pro this char-coal grill is no different in many features. It serves for large crowd says one customer. Only feature it falls short is the smaller side box where larger logs have to be trimmed to fit into the box. Apparently the overall design of the grill is excellent. The best features and lower price are the two main things customers wanted to have this char-coal grill. In order to cook evenly you may have to move all the items around. The overall performance of Char-Griller is excellent and very convenient than many charcoal grills you will find in the industry. For under $200, this grill is a steal and probably one of the best investments that you will ever make. With a much similar look like the Char-Griller outlaw, this is yet another top performing charcoal grill that you’re sure to love. The Char-Griller Patio Pro Model Grill has 250 square inches of cooking surface with a cast iron coated cooking grate and a large drawer to store your tools and cooking supplies. This Char-Griller Patio Pro will last a long time as it is made of 14-gauge steel construction which will provide years of durability. 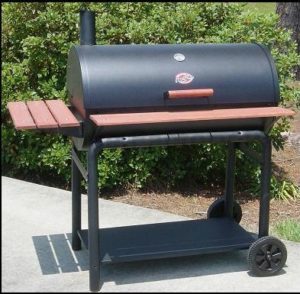 This Char-griller model has a double steel bottom which holds in the heat to prevent burnout and a side drawer coal and ash access for easy cleaning. This charcoal barbecue was designed with an added fire grate that holds coals off the bottom for even heat distribution and two side air vents to regulate the heat. The Char-Griller Patio Pro Model Grill is a nice compact patio grill for smaller get-together’s and is ideal for condo or apartment balconies because of its size. It may be small but this strong, sturdy cast iron grill appears to be very comparable to any full size grill of the same caliber. According to most new owners of the Char Griller Patio Pro, this lightweight yet solid unit far exceeds most compact barbecues you might find in any store. In fact, it actually beats out many full-size versions as well based on the quality of construction, materials, and ingenuity. Several satisfied reviewers actually purchased this mini-version of the full-fledged barbecue by the same manufacturer because of how well this style of Char-Griller performs. One such customer commented that he purchased the Patio Pro Model just for those times when he is grilling for his family and then brings out the “big boy” when summer barbecue season began. He said that this Char-Griller Patio grill is absolutely ideal for seasoned winter griller’s like him. The Char-Griller Patio Model is built with an air ventilation system that, according to many testimonies, is fantastic because it allows for even heat distribution from the cast iron grates and allows for those awesome heat grill marks for the ultimate grilling experience. Those that purchased this compact grill also appreciate the wooden side tray table that is very handy for setting down grilling accessories and is surprisingly able to withstand a lot of weight without becoming unstable. The built-in charcoal tray is extremely convenient for adding extra coal and soaked wood chips for added flavoring. Having this particular feature also makes cleaning up a cinch when you’re done. Many believe that this patio grill with its cast iron grates will no doubt last a lifetime and beyond and is an awesome high quality solid compact grill that will perform faster and easier than any gas grill on the market. There’s one aspect that most reviewers seem to agree upon and that is the assembly instructions are not clear or easy to follow. But by all accounts, everyone seems to believe that even with the confusing directions, once you figure it out and get it together, you won’t be sorry. It’s just that phenomenal of a grill. There were several reviews from Amazon that had some wonderful suggestions in the care and assembly for this grill. If you decide to purchase the Char-Griller 1515 Patio grill, please be sure to stop by and read “Howards Amazon Reviews” on the Char-Griller product page as well as “Vince” on the same review page. Both of these gentlemen are griller aficionados and can be a big help to you from experience alone. Our Bottom Line: The Char-Griller Patio Pro Model Grill is one great little grilling machine and will be your favorite grill of all time for your smaller intimate family barbecues. With this patio model, you can quickly grill up an entire family meal and have it all cleaned up before you could even begin to being coal-ready with a full-size grill. Once you get this baby together, you will no doubt want to grill everyday of the year with this little Char-Griller Jr. This Weber 758001 is a kettle charcoal grill, offering no-nonsense grill with an excellent ability in delivering perfect cooking. In addition, this grill of Silver series offers the beauty of an outdoor kettle grill which is very well-designed. This Weber 22.5 kettle charcoal grill will be perfect when you invite guests of moderate numbers for your backyard barbeque party. Or, it will be useful for just whipping up your evening meal. The construction of this classic kettle grill ensures the heat to radiate evenly across the cooking surface. There is a mechanism to maintain charcoal flare-ups at minimum level. As a pioneer in this grill industry, Weber really knows well in designing this Weber 22.5 kettle charcoal grill that satisfies the taste of beauty and performance in a single product. Being in Gold class, this Weber charcoal grill is designed to never rust and incredibly powerful. The company applies highest quality of materials to build this kettle. Being a charcoal grill, the product should face issue of cleanliness after use. This Weber 22.5 kettle charcoal grill applies a mechanism to have better catch of ash. The cast also prevents the vents and ash catcher from getting rust. This is an important offer for an outdoor grill. All parts of the hardware are combined to deliver extremely powerful and easy to transport grill. The offer goes on to the One-Touch system. Weber has already patented this mechanism which will prevent your hands from getting dirty when emptying the kettle. The system also guarantees simplicity. Does not have any idea what to cook? The package will come with a series of recipe and cooking tips. This is another bargain and many people also feel that this is the best charcoal grill under $200. Of course, there will be both supporting and neglecting comment when Weber 22.5 kettle charcoal grill has been launched to the market. Consumers just have ample of time to judge whether this kettle grill can meet their needs or not. Generally, this product can be accepted very well. Only a few complaints were addressed to the features this Weber 22.5 kettle charcoal grill. Some were disappointed in such accessories as the tool rack and side table, which disrupt the seal between the lid and grill. The lid rack also does not come as a good arrangement. However, being a Weber 22.5 kettle charcoal grill has really got reputation before its launching. In fact, the product comes as a good and worth-to-buy product. This grill gives even heat distribution without leaving any cold spots on the cooking surface. Simplicity in assemble, various purpose and occasion of use, durability, and convenient cooking are what people adore most when using this Weber 22.5 kettle charcoal grill. Being a Weber, this Performer 22.5 Inch Charcoal Grill has already a reputable image for delivering very aesthetically satisfying grills. Even, at your very first glance you can absoulutely admire it. This Weber Performer is not an ordinary grill – it is one of the best available in the market. Though in aesthetic feature alone this grill will beat all its contenders, the Performer adds its versatile cooking ability in its wonderful feature list. Using this Weber Performer 22.5 Inch you can perform all your grilling tasks easily. Being a charcoal grill, this Weber Performer 22.5 Inch is quite huge in a dimension of 28.5 by 50.2 by 40 inches and weight of 153 pounds. With such a physical dimension, this Weber grill is meant to suit your outdoor barbeque party rather than a portable version; however, it is still carriable. Of course, it has a charcoal storage container, which can perform perform well in all weather conditions. Two charcoal fuel holders are included. Weber Performer 22.5 Inch has total cooking area reaches 363 square-inches, quite spacious for throwing six large steaks altogether. This Performer charcoal grill features a Touch-N-Go-Gas system for delivering instant and reliable lightning. What is more? To ensure you about its quality, the purchase of Weber Performer 22.5 Inch Charcoal Grill comes with a ten-year limited warranty. Since this comes pre-installed, this Weber Performer 22.5 Inch only requires a little finishing touch before you can use it ready at home. The installment instruction should be no hassle to everyone since the instruction is pretty straighforward and equipped with clarifying pictures. Once you finish assembly, you will find high quality construction of a charcoal grill which is intended for a long term of use. Touch-N-Go gas ignition system is marvelous and smartly applied to this Weber Performer 22.5 Inch. While other grill operating on liquid should deal with security issues, this Webber’s Performer offers excellent experience of grilling. This ignition system is a good jumping-off point to further proceed feeling the spacious area of cooking due to 22.5 inches of grill equipped with large built-in serving table. Also, you should find no difficlties in adjusting your cooking temperature and timer. This Weber grill features simple and customize control buttons, which is easy to use. All you need is pushing the buttons. A very accurate built-in thermometer is attached. How about the taste? The purchase package will also come with recipe book containing plenty of wonderful recipes you should try at home. Using this Weber Performer 22.5 Inch, you will have original taste of grilling, which is delicious and juicy as well. 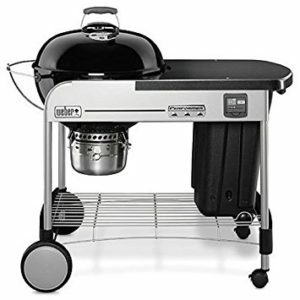 Charcoal grill usually involves cleaning issue after use; however, this Weber Performer 22.5 Inch Charcoal Grill has utilized removable ash catcher. Cleaning the ash after use is easier and quicker. The plus is that it does not rush. In addition, you can place your charcoal in its container for quick use. To close our list and countdown of the best chacoal grills under $200 is this amazing performer. Primo Oval XL 778, the charcoal grills which claimed its product to have the highest quality on the market at the moment. This smoking grill is a huge one with a cooking surface in the shape of oval, claimed to be the best possible use of cooking space. In this post, we will review Primo Oval XL 778 and see its pros and cons. As the grill is one of the most important things that you need to possess if you are planning about having a perfect barbeque party, you definitely must be able to find a good one to ensure that your party can go smoothly and everybody happy with the served meal. However, it is obvious that there are many brands of grill which claimed their products to be the best and able to provide you with various types, shape, and features. It is our job and our responsibility to be able to decide which one is the best to buy since you could not fully blamed the manufacturer if there is something wrong with the product that you purchase. It is also partially your fault since you are unable to cleverly choose the grill. After knowing this, I hope that any clever customers will improve the way of their thinking and start to concern with every details about the products that they wanted to buy. Never get attracted to buy a product just because it has a nice package or appearance. Do not get lured out with advertisement which says that there are nothing more perfect than their products since everything the human made is always have flaws. With the help of internet, we are now able to get any information about almost everything. Giving us opportunity to have more detailed information about something and provide us with many things to consider. That is why you better start to find some reviews and also articles to help you put together some information and figure out which one is the best grill that you will ever find. Let’s take an example from the Primo Oval XL 778. Not to mention that Primo Oval XL 778 have grills extensions to give you more cooking space available about twice. It is also said that their grills quality is definitely professional, which means that it is actually very simple and able to make any inexperienced griller will never have any trouble to start using it. But of course, it is also because they are providing you with manual instructions along with a set of recipes to make your work as better as minimal work could be. There are a lot of people consider that this is one of a great grills which able to become an oven and smoker without a hassle. According to several people who already purchase and use the grills, they are finding out that the ceramic grills which made in the USA are considered to be the largest and most versatile ceramic grills on the market. They are very pleased to know that there are many options and also add-ons to combine with the grills. These facts will surely able to make this Primo Oval XL 778 to stand out among the other grills on its class. It is also essential to not forget about picking up the extensions which are able to be use for more food. Most of the people are using the extensions racks of Primo Oval XL 778 to smoke meats and later find out that the result is awesome. According to one of the satisfy customer, you can purchase the drip pan racks and deflector plates in order to change the Primo Oval XL 778 into an oven. The deflector plates will be supported by the drip pan racks at the time you smoke the fatty foods. It is also a good idea to purchase the primo pizza stone to make your Primo Oval XL 778 able to produce nice pizza. If you are a person who is considered to be neat, then you have to possess grid lifter and ash tool to keep the cleanliness of the grills. Many of the satisfy customers are saying that it is very easy to learn about how to use the grills, proving that the manual book is indeed useful. If you wanted to have longer smokes, then you need to put some big chunks of smoke woods and use the chips for quick smoking just by tossing it into the coals. However, since there are a lot of people satisfy with their Primo Oval XL 778 purchase, there are also some people who are not satisfy with their purchase and even disappointed. One of the examples is about some customers who find out that the interior ceramic bowl of the Primo Oval XL 778 they purchased is cracked due to first usage at the nominal temperatures. What makes it worse is that the customer service completely ignored them and makes them problem unsolved. That is why it is important to know that this Primo Oval XL 778 oval is actually a great product but it is also depends on your luck to have a good one. After knowing about those things above, hopefully you make an informed decision on the best grill to go with. Charcoal grills are one of the least expensive grills and one of the most popular. They also are one of the grills that offer the most value for your dollar. They are durable, working dependably year after year. Most have adjustable racks which allow for some adjustment of the temperature. You can also use them as wood grills if you prefer the wood taste and smell. 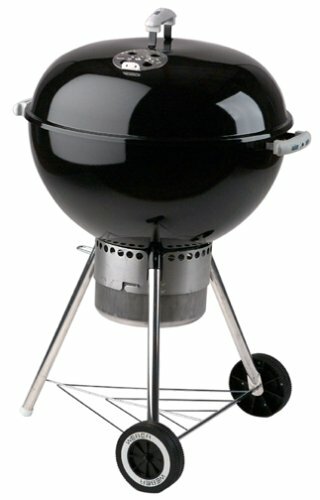 Charcoal grills have a reputation for having more intense heat and are more messy than other grills and should be cleaned before and after each use. Depending on the charcoal and moisture level they may take more time to get started and be harder to control. That being said they are still the most popular and are the center of many a picnic and barbecue. Hibachi– a very small, portable grill. They are made from heavy metal in the shape of fireboxes with vents. The grill grates are easily raised and lowered to adjust for the high intense heat. Kettle Grill-looks like two large kettles, one on top of another. One is the grill and the other is the cover. The cover has a vent. This allows for bottom to hold the charcoal and be the heat source while the cover being closed completes an oven type grill. Steel Drum Grills-are used by more commercial enterprises. They a e made from 55 gallon steel drums and are best used for large cuts of meat and whole hogs. 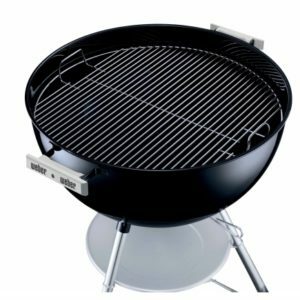 Charcoal grills come in all price ranges, metal weights, sizes and with many options. Some have attached side panels that are used as tables. They also have a variety of grill racks, baskets, warmers, starters, speciality charcoal, chunks and planks. There are also many types of cooking utensils that coordinate with your grill including tongs, forks, basting brushes, spatulas and hard bristle metal cleaning brushes. Charcoal grills are great for cooking just about everything. The most popular choices are burgers, hotdogs, brats, steaks, chicken and fish. There are an abundance of recipes available that are sure to please every palate. If there’s one thing everyone love, it’s the summer. And if there’s one thing most Americans love doing in the summer, it’s barbecuing. Barbecuing goes back as far as cave grunting and shag clothing. It’s as close to primeval as we can get without joining a commune. One of the most enjoyable ways to barbecue is with charcoal. Charcoal grilling is second only to wood fire grilling when it comes to cooking in the outdoors. But how to select the best charcoal grill leaves many would-be grunters in the lurch. What features will make the experience easier, more convenient, and ensure that the grill will last for many years, are the elements that make charcoal grill reviews important to the consumer. • The best charcoal grill will have a solid, heavy construction. Make sure the legs are sturdy and not wobbly. Safety is as important as tasty. • The unit should have a tightly fitted lid to keep the heat on the meat. Leaky lids ruin ribs. And make sure the handles are sturdy and insulated with a material that isn’t hot to the touch. All good charcoal grill reviews will stress safety and handles that are cool to the touch. • There should be a lid-mounted thermometer that provides an accurate readout of the internal temperature. For the best results, the inner heat probe should be able to be placed right above the meat. • The unit should be able to cook at high temperatures. If you’re a fan of searing, you’ll need to reach 700° or more. • It should also be able to keep low temperatures of 225 to 250 for long periods of time for standard barbecuing. • There should be air exhaust and intake controls to maintain the steady temperatures necessary; preferably one at the top and one on the bottom for optimal control. • There needs to be sufficient room inside for charcoal and food. Yes, it sounds like a “duh” statement, but if you’re preparing food for a family of five and suddenly Uncle Joe shows up with his newest girlfriend and her brood, you’ll need adequate room to add more charcoal and more food. You can cook just as easily in a large grill as you can in a smaller one. Even in charcoal barbecuing, size matters. As any true fan of barbecuing will tell you, it’s cheaper in the long run to not buy a cheap barbecue grill. Spend a few dollars extra to buy a well-constructed charcoal grill and the results will be much better for the long haul over the years. Charcoal or gas grill, which is the best? That is an age old question that will probably never be fully answered or agreed upon. There are strong opinions on both sides of the debate. The gas grill is more convenient to use, of course. It heats up relatively fast and the amount of necessary clean up after use is minimal. Just turn the heat up really high to burn off the stuff on the grate, then brush with a wire brush. Gas grills cook with clean fuel, but the flavor of food cooked on them is much like that of food cooked on a regular stove. When people choose a charcoal grill over a gas one, they usually do so because of the way the food tastes when cooked over charcoal as opposed to the gas burner. As charcoal burns, it generates smoke and heat, which produce a delightful aroma. As the food cooks, it soaks up the flavor and aroma of the smoke. The longer the food cooks over the charcoal, the better it tastes. That’s why steaks tend to have a better flavor than hamburger or chicken cooked over charcoal. The quality of charcoal you use is imperative to great tasting food. Cheap charcoal is made of sawdust with glue holding it together, not very likely to make food flavorful. Lump charcoal is made from real pieces of wood. You can also mix chunks of real hardwood with your charcoal. You will have to wait about twenty minutes for the coals to get hot enough before cooking and the grate requires regular cleanings, but the taste of the food cooked on a charcoal grill is well worth the extra time to lots of people. When you pile into the family vehicle for an impromptu picnic, a gas grill is impossible to take along. However, a charcoal grill, especially a small one, is relatively easy to transport, along with a bag of charcoal and of course, food to cook. While charcoal grills are less expensive to buy than gas ones, the ongoing cost of purchasing charcoal should be considered. Of course, with a gas grill you have the expense of buying gas for it regularly, so the gas grill is considerably more expensive overall. Whether you prefer a charcoal or gas grill, the most important thing is to get outside and start grilling a wonderful meal for your family. you may also want to check out the best gas and charcoal grill combo if you need the best of both worlds.